One of my favorite meals involves a good bagel with cream cheese, tomato, red onion and lox. Most of the ingredients for this are pretty inexpensive, except for the lox. Good Nova Scotia lox usually runs at least $20/lb or more. I could probably go through a half pound myself on a Sunday morning with a couple of bagels and it would be well worth the money. But why do this when you can make your own lox at home very easily. Real Nova lox involves curing and then cold smoking filets of wild North Atlantic salmon. It’s a similar process to making bacon, which is also still raw when finished. This is vastly different from hot smoking methods that simultaneously cook the food, like for smoked sausage and real barbecue. The following recipe is my frugal version of Nova lox. Instead of $20/lb, this barely costs more than $5/lb and maybe even cheaper if you find a good deal on salmon. I’ve had great luck with farm-raised salmon, which is much less expensive than wild salmon. Mix the salt, liquid smoke and pepper together. If the salmon still has the skin, cover just the flesh side of both pieces with the salt. Stack the pieces together with the skin side out. For skinless salmon, cover both sides with salt. Wrap tightly in several layers of plastic wrap. Place into a gallon freezer zip top bag. Press all the air out by folding the bag around the fish and then seal tightly. Put into the refrigerator and let sit for 2-4 days. When ready to eat, remove from the bag and plastic wrap and soak in cold water for 5 minutes to remove the pepper and rinse off some of the salt. If it still tastes too salty for you, soak it in water for another 5 min. Slice thinly at an angle to get the largest slices possible. This should keep in the refrigerator for at least a week, maybe longer. Any herbs and spices that go well with salmon would be great in this. Try adding dill or ground coriander to the salt. You could also try white pepper instead of black. My favorite way to eat this is to split a freshly baked bagel (I NEVER toast them) and cover with cream cheese. Then top with thinly sliced red onion and tomato slices. Place the salmon on top of this and add capers, if you like. I can hardly think of a better Sunday brunch food. You can also scramble the salmon into an omelete or use instead of Canadian bacon in Eggs Benedict. It’s great as an appetizer on top of crackers or toast points. You can also mix this into cream cheese for an easy bagel spread or use in a dip for crackers or chips. Enjoy the wonderful flavor and the fact that for 2lbs of fish you just saved about $30! 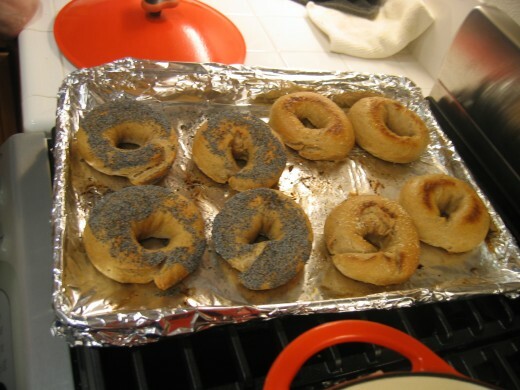 Oh yeah, my last batch of lox was so delicious that I decided to make homemade bagels to go with it. Here’s a photo of the bagels just out of the oven. I’ll post a recipe for these another day.